Certified Geographic Information Systems (GIS) Professional endorsed by a 3rd party (GISCI) though a peer-reviewed evaluation. Has met the minimum standards for educational achievement, professional experience, and manner in which he or she contributes back to the profession, and practices in an ethical manner. Must abide by higher guidelines for ethical behavior. Continues to educate and reeducate him or herself while preparing for recertification. Has had their professional background scrutinized and reviewed by an independent third party organization. An Institute comprised of leading non-profit associations (AAG, NSGIC, UCGIS, GITA, URISA, and GLIS) focused on the application of GIS and geospatial technology. Can come from anywhere in the world, and current, active GISPs reside in all 50 States and 25 foreign countries. Is more than a practitioner of GIS technology. Growing up, I had a mouth full of cavities and now have plenty of fillings to show for it. Little did I know at that time (back when I though I wanted to be a fireman) I would soon be making a living by working in that same building where I would go for routine checkups and teeth cleaning. No, didn't go in to dentistry (although if you stop by we could take a look at your teeth but I wouldn't trust our diagnosis). We recently purchased the former dentist office in Roanoke where just a few short months ago people were getting crowns and caps, now it is used for drones, ipads and desktop PC's. We are excited to make it our new home here at Cloudpoint Geographics. Ten (10) weeks of renovations consisted of ripping our old sinks and X-ray boxes, hoses, lines, excess wiring, tons of painting, new carpet, and best of all- the lighting. 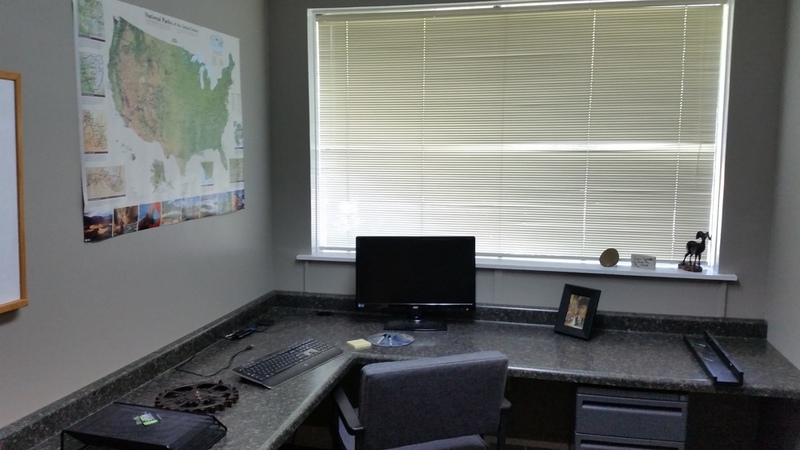 We converted an old lab into a kitchen, and exam rooms are now functioning as high-tech office space. The large window view that so many of us distracted ourselves with while a hygienist scraped on our jowls, is now enjoyed by our staff as each person has their own private office. We are blessed to have a new spot that so perfectly fits our current needs and the move was just across the parking lot from our old location. Be sure to come by and visit us during our upcoming Open House on October 2nd from 4PM to 6PM. Roanoke, IL, February 15, 2015– Cloudpoint Geographics is pleased to announce a partnership with Kovar & Associates LLC to offer professional aerial mapping services with UAV's (drones). Mr. Kovar is a licensed fixed wing and rotorcraft pilot and specialized cyber-security consultant. He has been involved in disaster response and search and rescue for over 15 years and has a passionate interest in mapping and imagery due to this experience. The Cloudpoint / Kovar team has submitted a request for an exemption with the FAA to allow for commercial drone operation for aerial mapping. The approval process is anticipated to take several months however these firms are committed to establishing a safe and effective program for using this technology. The FAA is currently in the process of developing regulations for commercial use of drones in many different applications. Cloudpoint is a dynamic geospatial solutions consulting firm providing mapping and GIS services for a variety of clients.